With over 25 years of experience managing risks and now a specialist in reducing HAIs, ICU helps train all those who work within a hospital including outside contractors. Studies show over half of the outbreaks of infection caused by Aspergillus were associated with construction and maintenance activities in hospitals. The cost of Healthcare Associated Infection cases cost hospitals over $30.5 billion dollars annually according to the CDC. 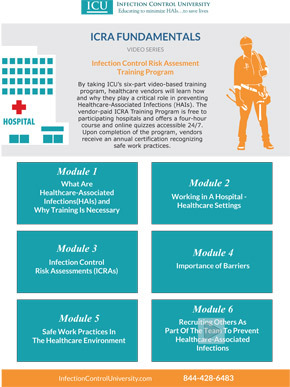 Our cloud-based training program provides Infection Control Awareness training certification to all hospital and contractor employees who work in your facility. Besides providing proof of training, our program helps you meet all CDC protocols, save you valuable time, enforces safer work practices and helps to promote a much safer, healthier facility.